You can use views to see the items in a list or library that are most important to you or that fit a particular purpose. 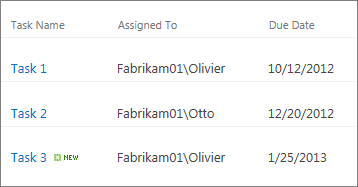 For example, you can create views of the files in a library that apply to a specific department or the items in a list that were created by a specific person. Views are available for the list or library you create them in. Each list or library has at least one view. In the browser, you can modify these views and create new views. 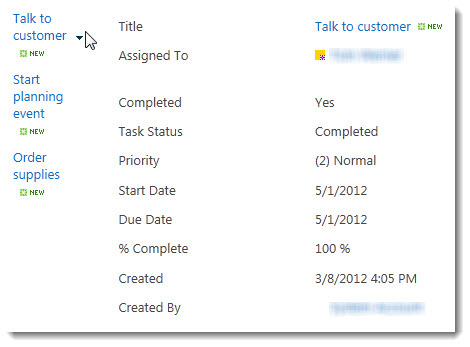 For example, a task list includes several views, such as All Tasks and My Tasks. You could modify these views by changing how the items in the list are sorted. Or you could create a new view that shows only that tasks that are incomplete. In addition to using the browser, you can use Microsoft Access to create forms and reports that are based on the list. Before creating a view, you may want to add columns to the list or library to enable more flexibility for sorting, grouping, and filtering the items in the list or library. For example, people may want to see only the documents in a library that apply to their department or the items in a list sorted by the project number. For more information about adding columns, see Create, change, or delete a column in a list or library. If you are creating views that will be accessed by phones and other mobile devices, you need to consider the capabilities of the mobile devices. The option that you choose determines the requirements for the data in the list or library and how the information will be displayed. For example, to create a Calendar view, the list or library must contain columns that can be used for the start dates and the end dates of the calendar items. 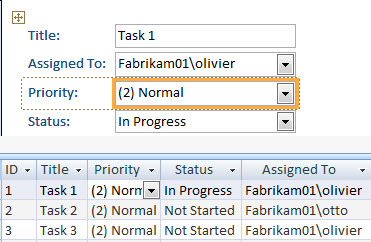 NOTE Once created, you cannot change the format of a view, such as from a calendar to a Gantt view. All predefined formats are not available for all types of lists and libraries. For example, there are view formats that are available only for discussion boards. The following are the formats available. Custom formats may also be available on a site. Standard View, with Expanded Recurring Events This view displays your list and library items one row after another. Use this view if you want to see each instance of a recurring event. NOTE This view is available in a Calendar list only. Calendar View This view displays your list and library in a format similar to a wall calendar. You can apply daily, weekly, or monthly views in this format. This view can be helpful if you want to see the items in the list or library chronologically. Calendar views have requirements that differ from the other formats. Datasheet View This view displays list and library items in a grid, similar to a spreadsheet. This view, also known as Quick Edit, can be helpful if you have to edit many items in a list or library at the same time. This view is also helpful if you want to export your data to a spreadsheet or database program. 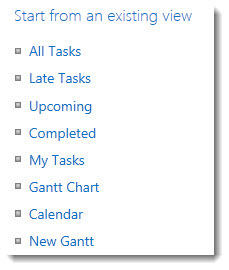 Gantt View This view displays list and library items in bars that track progress. A Gantt view can help you manage projects. You can use this view, for example, to see which tasks overlap each other and to visualize overall progress. Access View Use Microsoft Access to create forms and reports that are based on the list or library. Existing view If an existing view is almost the view that you want, you can save time by using an existing view as the starting point for creating your new view. IMPORTANT The maximum number of items in a view is 5000. You can manage the number of items in a view by using the filter and item limit settings. Default view All lists and libraries have a default view, which is the view that people see when they go to the list or library. You can change the default view to any public view for that list or library; you cannot set a personal view as the default view. To delete a view that is the default view, you must first make another public view the default for that list or library. NOTE If Make this the default view is not displayed on the create or edit view pages, you do not have the permissions to create a public view or the view is a personal view. To create a public view you need to be in the Designer group for the list or library, or have the equivalent permissions. Personal and public views When you create a view, you can set the audience for the view to be personal or public. A personal view is a view that only you can see. A public view is a view that anyone can see. When you create a view, if Create View is disabled you do not have the permissions to create a view. If the Create a Public View option is disabled you do not have the necessary permissions to create a public view. To create a personal view, you need to be in the Member group for the list or library, or have the equivalent permissions. To create a public view, you need to be in the Designer group for the list or library, or have the equivalent permissions. Columns The columns in a view contain the information that you need to see for list or library items. Columns, in combination with other features of views, such as filters, can help you see only the information that is most important to your work. This is especially helpful if the list or library contains lots of items. For more information about working with columns to create custom views, see the Column types and options article. TIP You can use some functions as filters, such as [Today] to show items when the date matches today or [Me] to show items for the user of the view. You can also combine simple equations with functions. For example, to show items created in the last seven days, filter on the Created column, set the operator to is less than, and set the value to [Today]-7 (no spaces). For more information, see the Introduction to data calculations article.